72" red, yellow, blue, low-permeation, barrier-type hoses, low-profile high and low side quick couplers with shutoff valves, and a professional dispensing valve for 12 oz. cans. 72" red, yellow, blue, low-permeation, barrier-type hoses and low-profile, heavy duty high and low side service couplings. 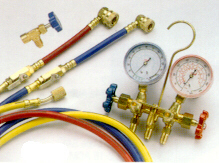 A professional mobile A/C manifold gauge made specifically for R-134a systems. A set of 72" red, yellow, blue, low-permeation, barrier-type hoses. An economic way to start servicing R-134a systems! Includes a quick coupler, 7" barrier-type hose and shutoff valve to prevent the release of refrigerant. Shutoff valve will attach to any 14mm Male hose. Heavy duty, low-profile, service couplings. Quickly converts your existing R-12 charging hoses over for use with R-134a systems. Includes high and low side quick couplers, a common service hose and shutoff valves to prevent the release of refrigerant. Shutoff valves will attach to any 1/4" SAE Female flare fitting. All Johnsen's charging hoses are constructed with the highest quality hose and components in the industry. These low-permeation, barrier-type hoses are rated at 600 PSI working pressure, meet SAE J2196 specifications and are available in a wide variety of lengths. Packed 1 per case. Designed for easy recharging of R-134a A/C systems using 12 oz. cans. Contains dispensing valve, hose and low side quick coupler. Slides over can and snaps shut. Also includes an adapter for small cans of oil charge. Makes servicing A/C systems with 12 oz. of refrigerant (and 4 oz. cans of oil charge) cans faster and easier. Same as #8013 above but also includes an additional fitting and adapter for cans of R-12 refrigerant. Makes servicing R-134a and R-12 A/C systems with 12 oz. of refrigerant (and 4 oz. cans of oil charge) cans faster and easier than ever before. #8013 and #8015 are also available in bulk packaging. For use with 12 oz. cans. Includes large handle for easier operation. Measures the level of R-12, R-22, R-134a or in A/C systems. High quality test thermometer for checking outlet duct and ambient temperatures. Conveniently fits in shirt pocket. Also available in bulk packaging. Contains a complete assortment of hardware necessary to convert R-12 A/C systems to R-134a. Kit includes standard and 90 degree high/low side conversion fittings, standard and deep Schrader valves, service port and termination caps, thread locking material, service labels and a handy organizer storage box. Packages include high and low side conversion fittings, a service label and instructions. These quality brass fittings are ideal for converting R-12 A/C systems to R-134a. Each fitting includes schrader valves and caps. Terminates unused R-12 service ports when converting to R-134a. 1/2" ACME service caps for cylinders, equipment, etc. Conveniently sized tube of thread locking material to permanently attach R-134a or conversion fittings to A/C service ports. 0.2 fluid oz./6ml tube. Double-ended valve core removal tool designed to remove/install both standard and large valve cores found in both high/low side service ports for R-12, and R-134a. 36" red and blue, 60" yellow hoses for use with multiple refrigerants including R-12, , R-134a, R-22, R-500, R-502 as well as other alternative refrigerants. 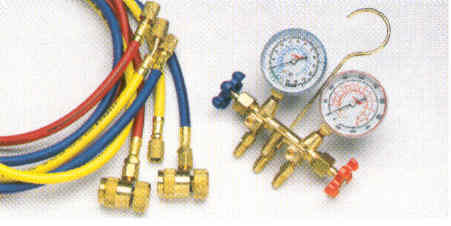 A quality replacement gauge for any multi-refrigerant manifold gauge set. Features a recalibration adjustment for long-term accuracy. Allows conversion of existing hoses for R-134a service. 1/4" Male SAE x 14mm Male. Converts R-12 service ports to R-134a Automotive. 1/4" Female SAE x 1/2-16 ACME Male. 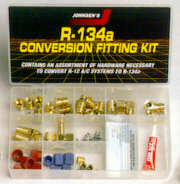 Converts Automotive R-134a service ports to R-12. 1/2-16 ACME Female x 1/4" SAE Male. Adapts 3/16" Male SAE high side service port on newer model R-12 vehicles to 1/4" Male SAE to allow for high side pressure monitoring. Makes it easy to connect charging equipment to hard-to-reach 1/4" SAE service ports. 1/4" Male SAE x 1/4" Female SAE. High quality test thermometer for checking outlet duct and ambient temperatures. Conveniently fits in shirt pocket. Also available in retail packaging. This deluxe Halogen Leak Detector uses the most advanced and sensitive corona discharge sensor ever developed, resulting in detection of 1/10 oz. per year of R-134a in the HI sensitivity range. Meets SAE J1627 specifications for R-12 and R-134a and is also compatible with multiple other refrigerants including R-22, R-500 and R-502 as well as other alternative refrigerants. The R-12 Professional Dispensing Valve is for use with small containers of R-12 and R-22. Includes oversized handle and locking base clamp for easier operation. This economical kit is ideal for use with small containers of R-12 and R-22. Includes dispensing valve, locking base clamp, charging hose and instructions. All Johnsen's charging hoses are constructed with the highest quality hose and components in the industry. These low-permeation, barrier-type hoses are rated at 600 PSI working pressure, meet SAE J2196 specifications and are available in a wide variety of lengths. Standard hoses includes 1/4' SAE 45° Flare x 1/4" SAE Female Straight fittings. Johnsen's charging hoses may be used with multiple refrigerants including R-12, , R-134a, R-22, R-500, R-502 as well as other alternative refrigerants. R-134a Automotive hoses are also available.